Cheryl Melody invites her audience to join her on an interactive magical journey of imagination, song, dance, storytelling, puppets, self-esteem, humor, fun, creativity, character-building messages, friendship, caring, manners, love…all rolled into one joyful and well paced concert. MEANINGFUL, CATCHY, CHARACTER-BUILDING MUSIC: Fun, Expansive, Consciousness-Raising, Nurturing, Hugely Interactive. COMMUNITY BONDING, GROUP BONDING: Special attention is given to create an environment in which everyone feels warmth and acceptance, and there is a feeling of being together as one music family, one planet of love, joy, positivity, tolerance, caring and respect. CREATIVE MOVEMENT: Structured, yet free-encouraging the development of kinesthetic movement, coordination, focus, musical expressiveness, fun and joy! STORYTELLING/LITERACY READINESS: Stories with meaning, puppets, interaction, and messages that nurture and enhance children from inside-out. 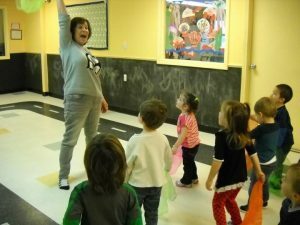 DRAMATIC PLAY : Children in preschool are part of every story, acting out the characters, voices and sounds. CREATIVITY: Imagination, interactive dramatic play, opening up creativity and self-expression, joy! 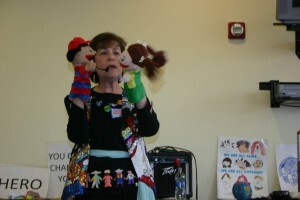 MULTICULTURAL PUPPETS: Multi-cultural puppets and other puppets are used as tools for storytelling and songs, and to help children feel safe and hear the words of a values-oriented story or song in a new way. The Values could be about self-esteem, accepting differences, realizing everyone has a special unique gift, manners, and more. UNIQUE INSTRUMENTS: Young children are mesmerized with the Tibetan singing bowl, referred to as the Golden Imagination Bowl, and it is often used in "The Musical Imagination Adventure Concert" and the “Peace Begins with You and Me” concerts. Often, the Conch shell is blown or unique multi-cultural instruments are applied. RHYTHM INSTRUMENTS: Children enjoy a parade with instruments, and we sing and march to familiar favorites as well as the original ONE PLANET-TOGETHER WE CAN LIVE song. MULTIPLE INTELLIGENCE APPROACH (Howard Gardner, Harvard University): The various intelligences of the child is woven throughout the concert-verbal linguistic, mathematical logical, naturalistic, visual spatial, musical, kinesthetic and more! ADDRESSING THE WHOLE CHILD: Activities that develop: Listening skills, observation skills, focus, concentration, coordination, focus. 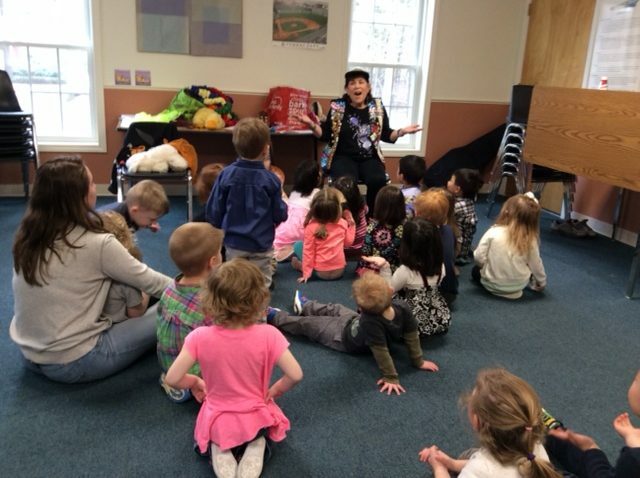 MULTI-DIMENSIONAL PERFORMING ARTIST: I integrate the many dimensions of singing, movement, imagination, puppets, instruments and complete interaction with the audience...all rolled into one joyful concert! 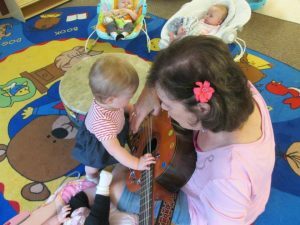 “2 in 1” TEACHING APPROACHES: I simultaneously teach the adults how to integrate a whole child music environment, while at the same time engaging the children.